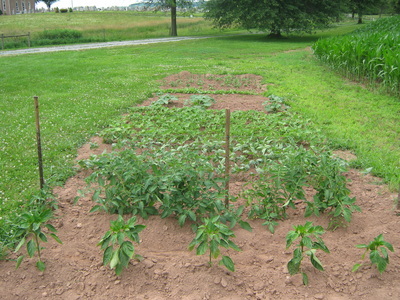 As of this writing the garden is beginning to produce some delicious fresh vegetables. 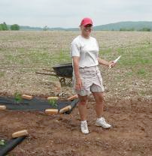 We planted all the usual varieties, both red skinned and white potatoes, radishes, cucumbers, onions, both yellow and green beans, peppers, tomatoes, cantaloupes, water melon, lima beans, zucchini, and red beets. As we begin to dig up the first of the potatoes, we’ll plant turnips where the potatoes were removed, to better utilize space. To date we donated 133 pounds and if all goes well, we hope to surpass last year’s total. The rain has been good so far for this season, so that is a plus. Also, the potato bugs seem to have lost their directions to the garden, and that too, is another plus. But there’s still plenty of time left so who knows, they may get their bearings straight and show up after all. When and if they do, we have a wonderful welcoming present for them, that we are sure they’ll not appreciate! This will be Ron and Wally’s last year for the garden. And as such, this is an invitation for others to start another garden, perhaps in another location, so we can continue to provide fresh food for those in need. Please do not pass up the opportunity to put into practice our Lutheran slogan; God’s work, our hands. As of this writing the garden is in its Fall seasonal period now. Some frost has damaged the more tender plants and they have decided that they have had enough already, so they have been removed. 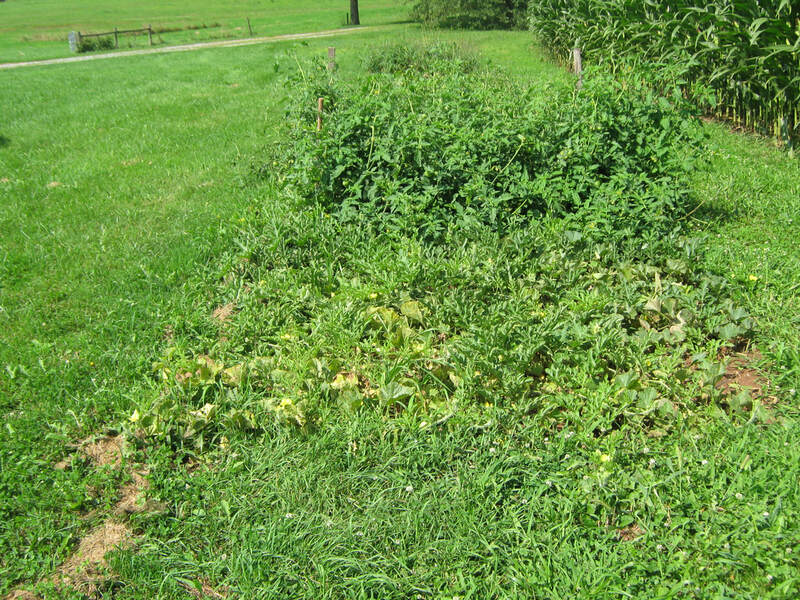 The tomato stakes and pea supports have fled the scene also. This year’s garden can be summed up in one word: DRY ! The potato plants were budding beautifully and showed a lot of promise, along with the tomatoes, peppers, and the beans in the Spring. However, with the dry and hot summer, the seed potatoes rotted right in the ground where they were planted, the plants dried up and we had a very dismal harvest as a result. At one point we even thought we saw the potato bugs having a rain dance! Most of the peppers did not really mature, and those that did were very small. The zucchinis dried up before they even had a chance to grow much at all. And it was disappointing to count all those tomatoes that dry rotted while still hanging on their plants. But all is not lost as there are still plenty of good strong turnips and radishes that were planted later and with just enough rain, they are doing fine. When they reach full maturity they will fill the plates of those that are less fortunate than us. 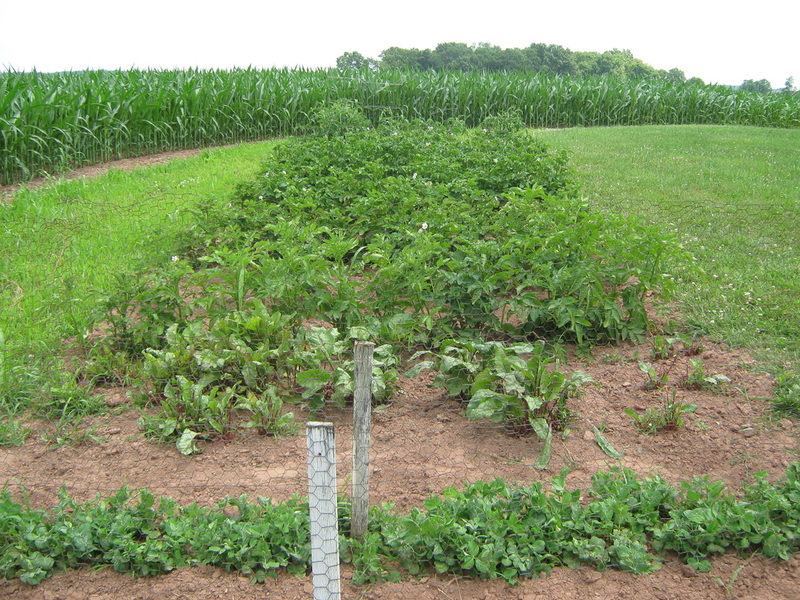 To date the garden has only produced just over 220 pounds and it usually gives between 650 and 700 pounds for a season. So you can readily see that this summer’s drought has taken a heavy toll. Gardening gives you just a sampling of what our farmers deal with each and every year. But thank God that we have them, or we’d all be mighty hungry! Remember: it’s Gods’ work, our hands. The garden season is in full swing now, although we could use some more rain, with many of the vegetables either becoming ripe or they have already been harvested. Those harvested include onions, radishes, squash, yellow and green beans, zucchini, and a few peppers and tomatoes. There are plenty more tomatoes on the vines waiting to fully ripen, along with red skin and white potatoes, cantaloupe, more green peppers, green and yellow beans from the second planting, red beets, zucchini, and hopefully some cucumbers. 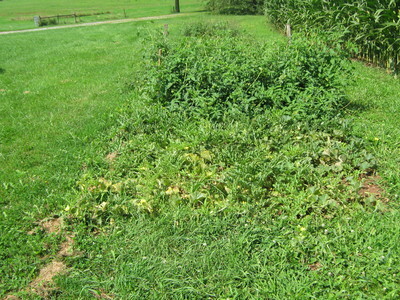 We planted some real nice burp-less cucumber plants and a few days later high winds twisted most of them almost completely off their stems. Needless to say, only 2 plants survived. Then we planted seeds in the remaining mounds and some varmint dug into the mounds and ate the seeds! So we are now nursing a few lonely plants and praying for the best. And, less varmints! 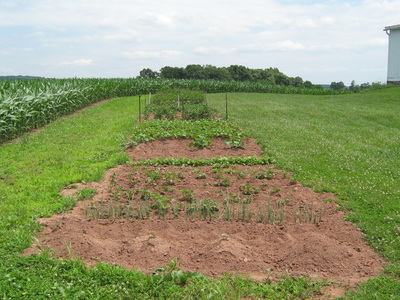 We plan to plant turnips in the space where the beans and carrots are now, after they have finished producing. 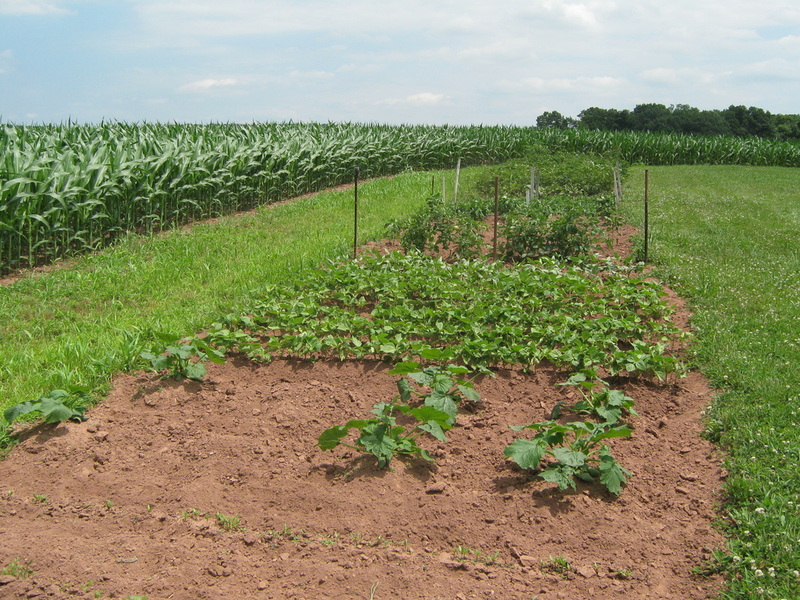 We try to use the ground twice a season so we can harvest more vegetables from the same size plot. So, call either Ron Henry or Wally Foreman if you would like to help with the garden and they will try to help you cure your urge to dig in the dirt. And, you will receive a good feeling knowing that your efforts will have helped feed someone in need. Remember: it’s Gods’ work, our hands. November - The garden season has come to an end, and this year it has produced 603 pounds of fresh veggies for New Hope Ministries. The last of the sweet potatoes, turnips and lima beans were harvested and when you read this article the garden will have been tilled under for the long winter’s rest. 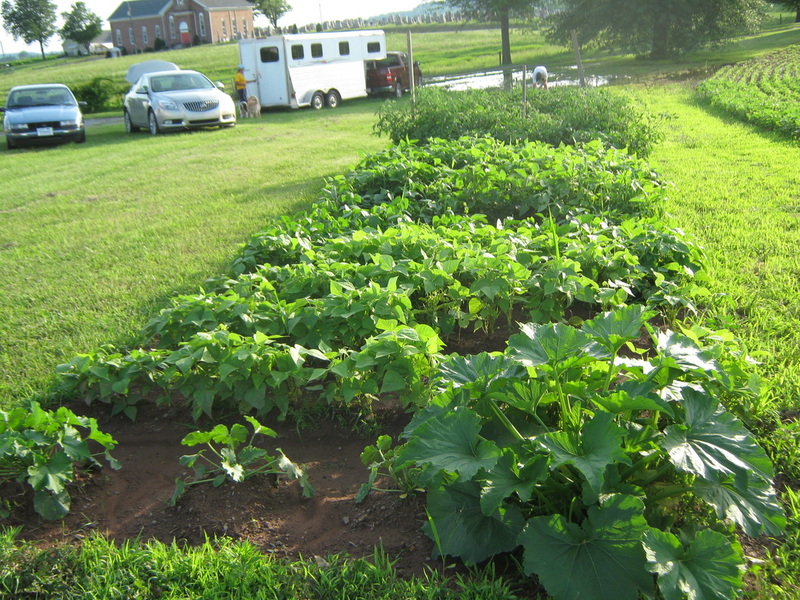 The garden actually produced more than the 603 pounds but you must remember that we reported those pesky garden vermins sent out some scouts to report back on their findings, and they must have brought out an entire brigade to raid it, and they did a mighty fine job too. They cleaned out the cabbage, twice, just about all of the carrots, and since they believe in variety, they devastated the red beets too. But, at least they ate healthy. Many thanks for Ron’s guidance, Wally’s assistance, Loren’s use of the ground and her tiller, along with Laura’s help with deliveries. The garden would not have been successful without their combined efforts. The Spring of 2016 will herald another and new, garden season. 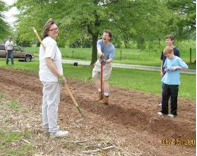 June - Well, now that what seemed to be an almost never-ending winter season, with bone chilling temperatures that has finally left for parts unknown, it is once again time to turn our attention to our annual garden for New Hope Ministries. The garden has been tilled, fertilizer has been applied, and the plants and seeds have been planted. That includes: radishes, beets, potatoes, carrots, onions, tomatoes, peppers, green beans, lima beans, yellow beans, squash, peas, lettuce and spinach. 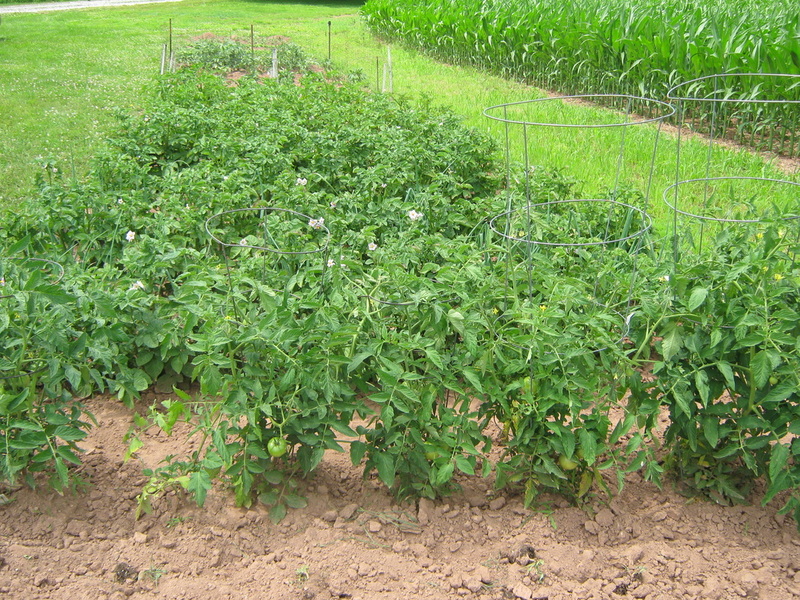 The tomatoes have been staked up for support and the peas have fencing to support their growth. 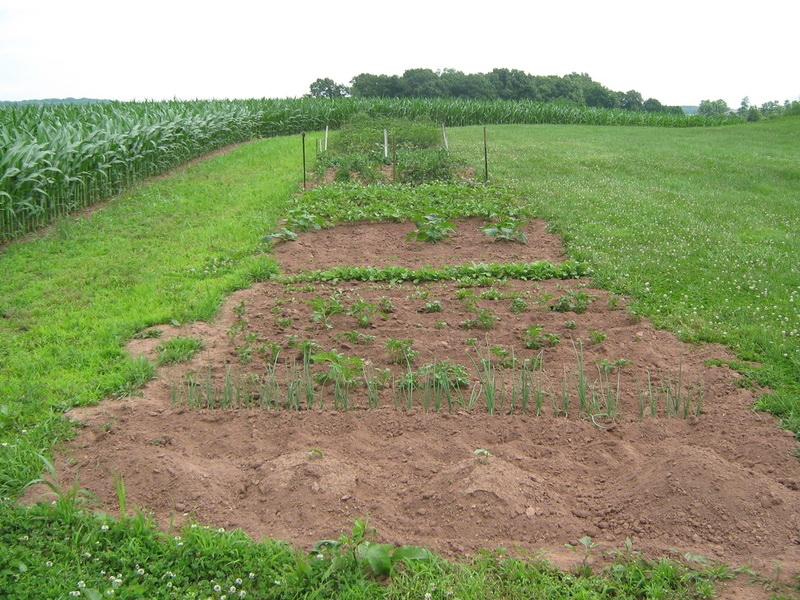 As of this writing (June), we have delivered 74 pounds of fresh vegetables to New Hope, mainly radishes and onions. This has been a great year for the radishes, so far, as they are the biggest we’ve had in several years. They are good and firm too, not soft and woody. 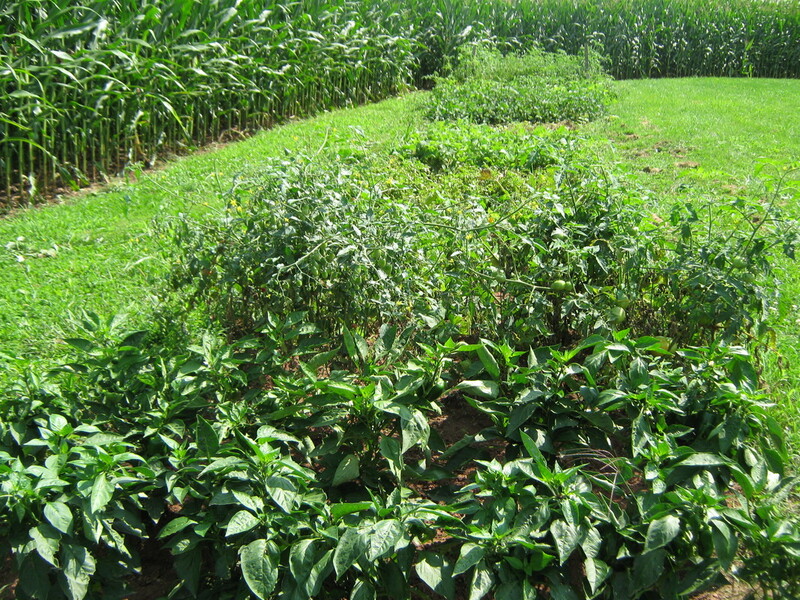 The peppers look good, some tomatoes are started, and the potato plants are big and bushy enough that they almost appear to be a hedge. So, we are anticipating a fine yield this year from the garden. If you should find yourself with an uncontrollable urge to get in the dirt, just call Ron Henry or Wally Foreman and they will assist you with trying to satisfy that urge, and you can feel great knowing that you helped feed a hungry person, too. 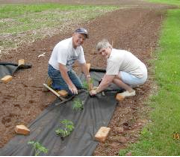 Carings & Sharings eNews of the Lower Susquehanna Synod featured our Garden Of Hope in their Oct. 22, 2014 Issue...click on pdf file (below) to see full article. The garden is doing well. The plants and seeds have responded in fine fashion and we have already taken radishes and onions into New Hope…and there are plenty of both, almost ready again. 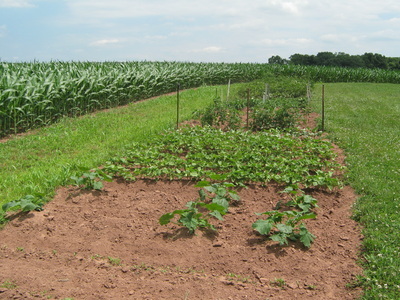 That along with the other vegetables that are growing nicely gives us high hopes for another bountiful harvest. Now if only we could keep the rabbits from eating the cabbage plants. July - The Parish Garden of Hope is doing well. There have been 131 pounds of fresh produce delivered to New Hope Ministries so far this year and, as of this writing, it’s still very early in the summer season. So we can expect good things from the garden and much more free food for those in need. We’ve planted all the usual varieties of veggies: red skinned potatoes, onions, radishes, carrots, red beets, cabbage, cauliflower, green peppers, sweet peas, tomatoes and cantaloupe. Of course, the Parish garden is looking for some much needed rain, as is every other garden too. But, we know that the rain will come. 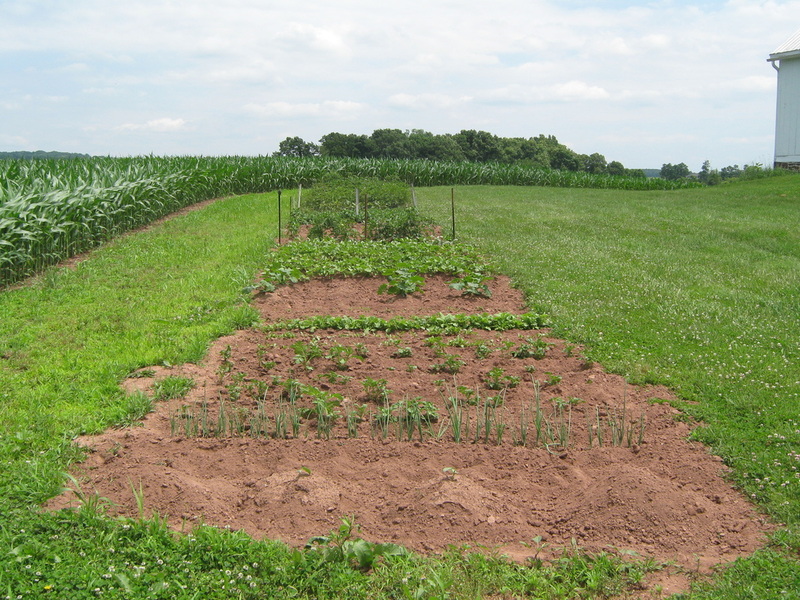 September - The garden has produced 506 pounds of fresh vegetables as of this writing, and there are still radishes, red beets, beans, tomatoes, turnips, and spinach in the ground that have to be picked when ripe. It seems a little cool this early in September and as long as the frost can be patient a little bit longer, we should be able to increase that figure. The garden has been very good to us this year and the effort that was applied has rewarded us with the opportunity to feed those in need through New Hope Ministries. The reception at New Hope was always one of sincere appreciation whenever we delivered the vegetables. Our praises go to our Lord for the bountiful harvest, and our gratitude to those who so unselfishly dedicated themselves to working in the garden. And we would be remiss if we did not express our appreciation to Loren Swivel for donating the space required for the garden. Thanks to all. 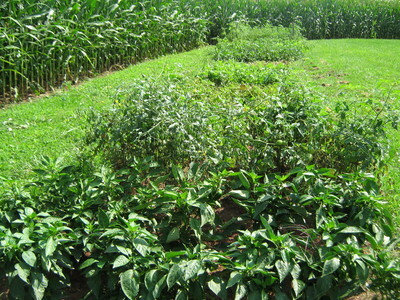 The Garden of Hope - Final Harvest - 2011 - It was truly GREAT harvest all in all. 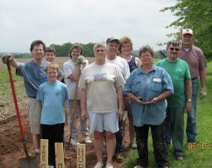 The folks of Faith United Lutheran Parish planted, weeded, and harvested over 880 pounds of vegetables…corn, squash, tomatoes, potatoes, cucumbers, pumpkins, beans, cabbage, onions, and peppers were several of the crops. A special thanks to ACE hardware, Ashcombe's, and Yorlet's Farm and Garden for greatly discounting their gardening items. Also, Thrivent Lutheran for donating what would become REALl SEED money for this project. And, thanks to Jimmy Eisenhour for his initial rototilling.